1. 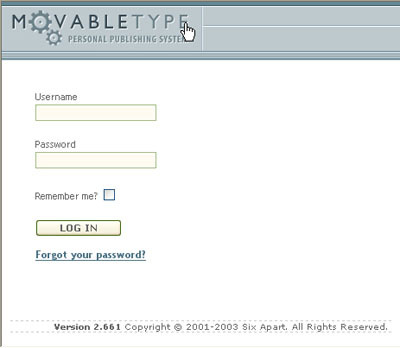 Download latest Movable Type from http://www.movabletype.org/. We recommend you to download the ZIP-packaged version of the FULL VERSION with LIBRARY. 2. Un-zip the package to a dir under your web document root directory. For example, if your web document root directory is c:\inetpub, then make a sub directory called 'mt' such as c:\inetpub\mt , and extract the zip file you just downloaded to that folder. [required] perl processor : You need to install ActivePerl, included in this tutorial. 4. Open mt.cfg with a text editor and edit the following values (Red fonts are sample values. DO NOT COPY. Set your own values). At the end of mt.cfg, you MUST append the following lines because they are not present by default. You also need to create a database for mt to use. Let us call it mtype. Note: Your mysql password is not saved in this file. Therefore, you should edit mt-db-pass.cgi and place your password in the first line of the file. If your password is empty, simply make it an empty file. If you see the following text at the end of the page, your mt.cfg is correct and your perl is ready. Your server has all of the required modules installed; you do not need to perform any additional module installations. Continue with the installation instructions. Then, run 'http://YOUR_SERVER_IP/mt/mt-load.cgi' and you should get the following result. Now, delete mt-load.cgi. Mapping templates to blog archive types... Mapping template ID '12' to 'Daily' Mapping template ID '12' to 'Weekly' Mapping template ID '12' to 'Monthly' Mapping template ID '13' to 'Category' Mapping template ID '14' to 'Individual' Done loading initial data! All went well. VERY IMPORTANT NOTE: Now that you have run mt-load.cgi, you will never need to run it again. You should now delete mt-load.cgi from your webserver. FAILURE TO DELETE mt-load.cgi INTRODUCES A MAJOR SECURITY RISK. Now, run 'http://YOUR_SERVER_IP/mt/mt.cgi' and you should see the login screen. The default username and password for the first login is Melody/Nelson. Click 'Edit your profile'. Edit the password for default user Melody for security reason. 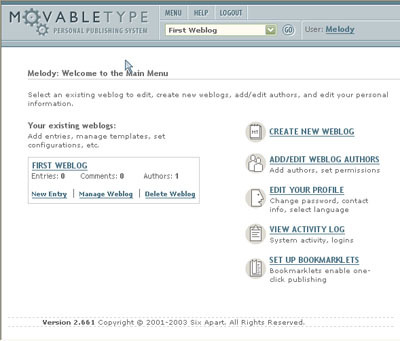 Now you may start to use your movable type software.